I will be working with several chef friends on a Spanish themed wild mushroom dinner at the McCloud Mushroom festival at the foot of stunning Mount Shasta. More information will be added in upcoming weeks, including a detailed menu. I will be returning to one of my favorite mushroom areas again this year. I will be doing a mushroom cooking presentation, and participating in as many of the other activities as time allows. More info will be provided as the event gets closer. I will be doing two mushroom cooking demonstrations as well as a book signing at this world famous event. More specifics will be added as they become available. I will be co-leading a foray, doing a cooking demonstration and presentation, and taking part in as much of the festivities as I can. I will be doing a presentation and cooking demo for the Cascade Mycological Society’s monthly meeting in Eugene, OR. I will be joining the Puget Sound Mycological Society’s annual Ben Woo memorial foray, doing a presentation Saturday evening, along with a 3 hour cooking workshop. Excited to be in Portland doing a presentation and cooking demonstration with lots of tasting samples. This extremely intimate event will take place in the beautiful Phillips Hill tasting room. Five or six courses of wild mushroom based dishes, will be paired with two wines each - one special wine from Phillips Hill’s library, and one Burgandy. The event will be proceeded by a mushroom hunt in the oak woodland on the Phillips Hill property. This very special event is unfortunately already sold out! This dinner is in the works. More info will be announced later as details become more clear. I will be returning as part of the staff for the SC Mycoflora foray for the 4th time. Check back later for more information as this event gets closer. After a successful and fun first pop-up, my friend Todd Spanier and I will be returning to Kaffeehaus in San Mateo for another pop-up dinner on March 28th. This pop-up dinner will be a tribute to Spain, which is quickly becoming my adopted 2nd country, and will again feature wild mushrooms in all 5 of the courses. We are excited to bring in our friends at Quinta Cruz/Santa Cruz Mountain Vineyard for the wine pairings this time around. Quinta Cruz specializes in Spanish and Portuguese wine varietals, perfect for this menu, and happens to be one of my favorite local wineries. Winemaker Jeff Emery will be at the dinner talking about the wines and helping to pour. Tickets are again priced at $65 for the 5 courses, and must be purchased in advance. Wine pairings will be charged separately at the event for $45. I will be providing 4 different chaga-filled, mushroom hors d’ouevres based on recipes from the book. This is a fun little event with Far West Fungi and The Chaga Company. Demonstrating how to cook several different dishes using medicinal mushrooms. Open admission for attendees of the fair. I will be doing a cooking demonstration at 1PM, as well as have a table where I will be selling and signing books. Please come by and join in this first big event for the Marin Mycological Society. I will be on staff again for this very fun event, doing a demo and cooking class, and helping with forays. Check back for updates. This new event will be taking the place of the MSSF fungus fair this year. I will have a table signing books, and most likely have some tasty samples for people to try as they come by. This special wine and mushroom pairing event will be held in the barrel room at Beauregard Vineyards in Bonny Doon. 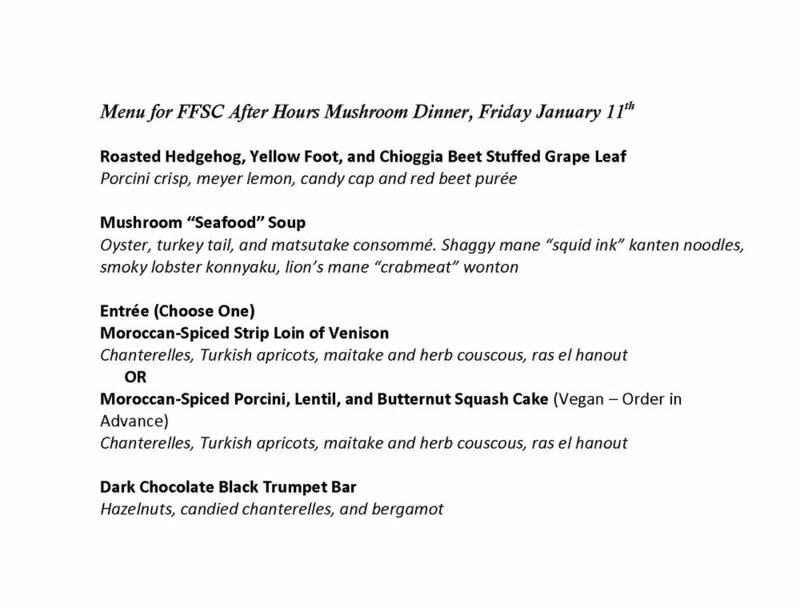 I will be teaming up with Todd Spanier (CA Truffle Orchards, King of Mushrooms, Chef’s Lounge) for this 5 course mushroom menu with wine pairings. Come find my table at the fair, where I will be selling and signing books all day. I will be doing a mushroom cooking demo/worskshop on Saturday evening before dinner. Also, I will run an informal, post-dinner mushroom tasting and social if weather and circumstances cooperate.